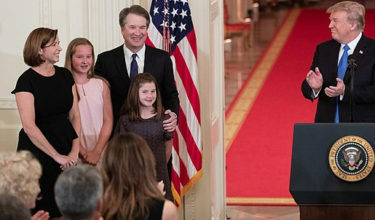 President Donald Trump nominated Judge Brett Kavanaugh to the U.S Supreme Court last night. If confirmed, Judge Kavanaugh would replace retiring Supreme Court Justice Anthony Kennedy, giving conservatives a presumed 5-4 advantage on the High Court, according to many legal commentators. Judge Kavanaugh currently serves on the D.C. Circuit Court of Appeals. He was nominated to that position in 2003 by President George W. Bush and was confirmed by the Senate in 2006 by a vote of 57-36. Prior to this, he served under President Bush as Senior Associate Counsel to the President, and as an Assistant to the President and Staff Secretary to the President. He is a graduate of Yale Law School and was a clerk for Justice Anthony Kennedy. He is married with two daughters and is Catholic. Judge Kavanaugh’s nomination now proceeds to the U.S. Senate where a simple majority vote is required for confirmation.